Barnes & Noble unveiled a new reading tablet device at its flagship store in Union Square in New York on Wednesday. For the first time we saw the Galaxy Tab 4 Nook, produced in partnership with Samsung. The two companies showcased the 7-inch Android tablet running a customised version of the Nook software at the New York event. The device is now available in black or white at Barnes & Noble retail stores nationwide (USA) and online, priced competitively at $179 ($199 with an instant $20 rebate). "It's the first ever full-featured Android tablet designed for reading," said B&N CEO Michael P. Huseby. The book retailer hopes that this partnership, which was first announced in June after B&N decided to stop making its own devices, will bring its Nook platform to a more familiar and fully-featured device. The tablet is the first product to come out of the partnership and design wise, looks very similar as the regular Samsung Galaxy Tab 4 7.0. The Galaxy Tab 4 Nook device is pretty much identical to the Galaxy Tab 4 7.0; with a 1280x800p touchscreen display, a 1.2GHz quad-core processor, 1.5GB of RAM, GPS, Bluetooth, a 3MP rear camera and 1.3MP front snapper. It will only come with 8GB of internal memory, expandable via a microSD card slot. The new Nook tablet is available in a Wi-Fi version only. 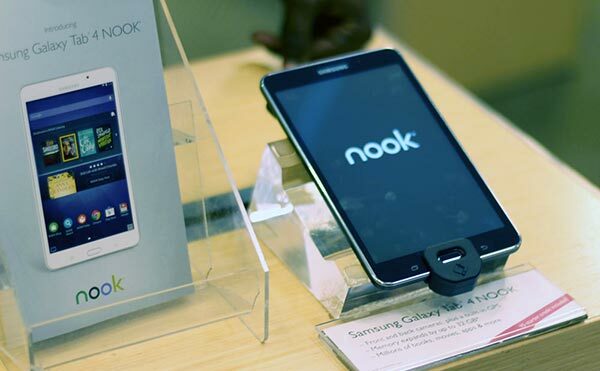 The launch comes nearly two years after the B&N's last tablet release, the Nook HD. It is probably worth noting that Samsung's standalone version of the tablet is priced the same at $179. What differentiates the two is the customised Nook software running on top of Google's Android 4.4 OS, which is not just the Nook app preinstalled on the tablet. Widgets can be found on the home screen to give users direct access to all the content in their Nook library, and a Reading Now button in the bottom left-hand corner will quickly bring up what they were reading last. 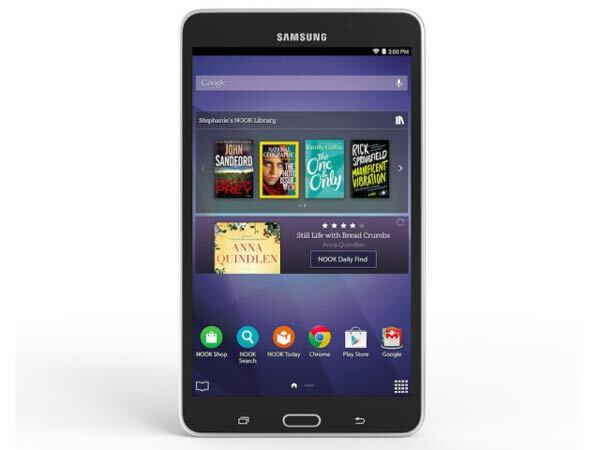 There is a considerable incentive to buy the Galaxy Tab 4 Nook version due to the bundled $200 of free content from B&N. This includes a number of best-selling e-books, 14-day trials to four digital magazine issues in addition to the previous 12 issues of those publications, TV shows and $5 of Nook Store credit to spend as you wish. Huseby claimed in his presentation that the company has the "Barnes & Noble advantage," with personnel across nearly 700 stores providing in-person customer services, which Amazon cannot match, reports Forbes. For now, the device will only be available in the US. Amazon to pay e-book authors based on number of pages read Amazon launches 300ppi high contrast Kindle Paperwhite Samsung postpones Galaxy Fold consumer launch Has Samsung been chosen for Intel Xe GPU manufacturing? Does the Samsung Galaxy Fold hinge and screen lack durability? Oh, can't wait for the full android hack! I was in one of the big bookshops in Edinburgh at the weekend and spotted that they were selling their Nooks (eInk and colour-LCD) at a pretty reasonable discount. Perhaps this is the reason. Not that I'm a potential customer for Nook - Kindle offers a lot more for UK customers, and I'm pretty annoyed with B&N over their treatment of non-US Fictionwise customers.